Programs for children, youth and seniors expand horizons and offer career possibilities. To introduce high school youth to our working waterfronts, with the emphasis on job opportunities available in the maritime industry and educational requirements needed to achieve these jobs. Invite maritime industry leaders to accompany Working Harbor staff to high schools in NY/NJ to talk about the past, present and future of working waterfronts worldwide, the impact on global economy and types of jobs available in the industry. After in-school workshop, educators from the high schools help to identify students who may have an interest in the maritime industry. Working Harbor takes these students on a port terminal tour followed by a boat tour of the harbors of New York and New Jersey. (c) Financial aide, scholarship programs or other resources available to pay for higher education. 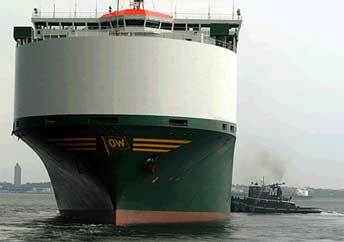 A scene from a recent tour for kids - a giant ro-ro (roll on - roll off) ship being pushed by a tug 1/100th of its size.